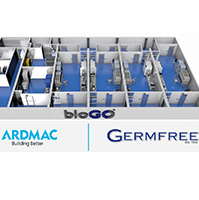 Germfree to provide a featured exhibit of a fully functional mobile adaptive bioproduction suite at the upcoming INTERPHEX Show March 21st through the 23rd, 2017. This innovation mobile adaptive bioproduction suite will also be the included in the IPS Technologies Tour guided by internationally recognized experts. The Ventilated Workstation (VWS): A Low Cost, Sustainable Alternative to the Class II BSC for AFB Smear Microscopy. Presented by Joe Masella at the Asia-Pacific Biosafety Association Annual Conference, Bali, Indonesia, 26th & 27th April, 2012. The American Biological Safety Association or ABSA was founded in 1984 and since that time has served to “promote biosafety as a scientific discipline and serve the growing needs of biosafety professionals throughout the world.” The organization also plays a critical role in the time exchange of biosafety information. The American Society of Health-System Pharmacists or ASHP is a 35,000-member national professional association that works on behalf of pharmacists who practice in hospitals and health systems. The organization represents pharmacists who practice in hospitals, health maintenance organizations, long-term care facilities, home care, and other components of health care systems. In this interview, Jeff Serle from Germfree speaks with IFBA, the International Federation of Biosafety Associations about “Strengthening Global Biosafety”. The 2nd International IFBA Conference took place June 28-29, 2012 in Johannesburg, South Africa. Please watch Germfree’s video featuring a recent project where we delivered a BSL-3 laboratory to East Asia and made the bio-containment lab operational in only 21 days. This Biological Safety Level 3 (BSL-3) modular laboratory was manufactured by GERMFREE in the U.S. and then installed in East Asia. Germfree’s Jeff Serle has authored an article on sustainable laboratory design for R&D Magazine. He explains how modular biocontainment labs can be designed and engineered for optimal energy efficiency. 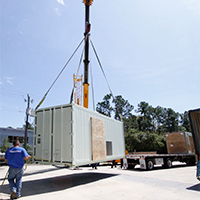 Specialized HVAC systems combined with a range of other engineering considerations are critical for labs that are installed in remote or developing regions. 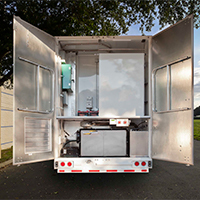 This comprehensive walk-through video describes our new Turnkey Mobile Compounding Pharmacy. The 53’ pharmacy cleanroom trailer meets USP 797 requirements for compounding sterile preparations. The mobile compounding facility is also designed for compliance with the proposed USP Chapter 800 and is tested to the latest CETA CAG-003 guide for sterile compounding facilities.